Authentic Essays | Custom Research Paper, College Term & Essay Writing Services Hair loss Rogaine Rogaine for men Rogaine for women Does Rogaine really work? You are trapped between a rock and a hard place. On one hand, you do not want to lose your hair and yet on the other, you are skeptical on trying Rogaine wondering whether it really works. This article is precisely meant for you as it will put your fears at bay. Through research supported by facts, testimonials and user reviews, we have compiled a list that shows that Rogaine really works and given you reasons why you should not lose your precious hair for fear of trying it out. A cycle in the human scalp is initiated once a person starts using Rogaine. This cycle starts with the active ingredient In Rogaine called minoxidil penetrating the scalp. Once this happens, the effect is further hair loss for the first two weeks of continued application of the product. To many this serves as a discouragement as they are looking for a way to regrow their hair and not to further lose it. However, should expect this to happen as it is just a temporary side effect that is a positive indicator that your old hairs are being shed off, and the scalp is preparing for the growth of new hair. This is the key ingredient present in Rogaine and plays the role of stimulating hair growth and slowing balding. The antihypertensive reactivates the hair follicles once it penetrates the scalp resulting in the production of invisible hair. Besides, minoxidil also promotes the growth of the hair by ensuring that the growth phase of the hair is lengthened. At this stage, there is ample room for growth of the thicker hair as the scalp is well aerated and users of the product start seeing results over the first few months. However, these results are not definite since the first phase of hair growth produces soft hairs that may be colorless and unnoticeable. Definite results start appearing from four months onwards of continued use of the product on a daily basis. Numbers do not lie. The most important aspect for any verification to be deemed credible is to be supported by a wide array of data that is not controversial but aligned with the question at hand. In this case “Does Rogaine really work?” is the question to be substantiated. There are verified results when it comes to looking at hair loss treatment. Some research have been done on minoxidil and its effectiveness. Data have been compiled for over twenty years since this is the time the product has been around. Over this period, evidence on its effectiveness has been piled up. Rogaine has undergone scientific, clinical testing to prove its effectiveness. Initially, minoxidil was a supplement contained in tablets for high blood pressure. Doctors attending to this patients then noticed that they started growing new hair, and this is when the drug was reformulated with the purpose of growing hair. The drug is more effectiveness in treating baldness that occurs on the top or growth as opposed to other parts of the head. According to clinical testing trials, men with bald heads on the top had a 48% success rate in recovering their hair on a moderate to dense regrowth of the hair. 36% of the men reported a minimal regrowth while only 16% showed no regrowth. A test carried out on women showed similar results which mean that the medication works similarly for both men and women. There are only two hair loss treatment drugs in the market that work. Clinical treatment has been carried out, and their effectiveness cannot be overemphasized. The two medications are Rogaine and Propecia. However, after undergoing rigorous testing, women Rogaine minoxidil form is the only FDA approved hair treatment drug for women. With a 5% concentration of minoxidil, the form has a high regrowth rate of hair in women and substantially ensures that hair loss does not occur. Any drug that has been approved by the FDA means that it surely works and have no severe side effects to the applicants. For this reason, it is safe and sound to say that Rogaine works. 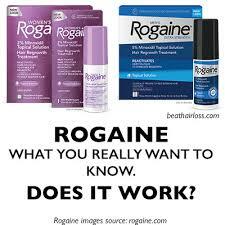 Rogaine is not a cure for hair loss but a treatment that guarantees that your hair will regrow. Other than the oblivious and typical result of regaining your hair loss, there are other advantages associated with the use of Rogaine. Among them is the fact that it is the only FDA approved treatment for treating hair loss and ensuring that it does not occur for women and men. It can also counter hair loss when detected early. Once you realize that you are losing hair, it is recommended to start the application of Rogaine as it slows the progression of the hair loss. Also, the side effects associated with the use of Rogaine are few, and when used as directed in the lotion, serious side effects are minimal. Another advantage is that hair transplant patients can also use the product. It is recommended by many surgeons for quick regrowth of hair of the transplanted hair follicles. If you are experiencing hair loss, the first thing is to come to terms with your loss. Once you do this, you need to realize that a solution is available. We highly recommend the use of Rogaine. You can see user reviews from online sellers of the product such as Amazon and combined with the research contained in this article; you can be assured that the product works. Boost your self-confidence by regaining your hair through using Rogaine.